NASA astronaut Shane Kimbrough rests outside the Soyuz M-02 spacecraft shortly after he and Russian cosmonauts Sergey Ryzhikov and Andrey Borisenko touched down on the steppes of Kazakhstan April 10, 2017, after 173 days in space. "It was a textbook touchdown," NASA spokesperson Rob Navias said during live NASA TV commentary after the landing. "The Soyuz was pulled by its main parachute onto its side, but the crew was quickly extracted and are in good shape." Those monitoring the launch at Mission Control, and on NASA TV, had "some of the most spectacular video we've ever seen" of the capsule's journey down and landing on the cloudless steppe, Navias said — about 14 minutes of footage, from just after the chutes deployed to touchdown. The Russian Soyuz capsule carrying the International Space Station's Expedition 50 crew lands safely in the steppes of Kazakhstan on April 10, 2017. The capsule returned NASA astronaut Shane Kimbrough and Russian cosmonauts Sergey Ryzhikov and Andrey Borisenko to Earth after 173 days in space. Ryzhikov, who has now completed his first-ever space mission, commanded the Soyuz. Expedition 49/50 marked the second space missions for both Kimbrough and Ryzhikov. 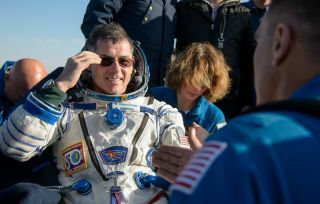 The three space travelers shared their ride home with science samples and other cargo along with personal items, according to NASA's space station blog. Still on board, Whitson, French astronaut Thomas Pesquet and Russian cosmonaut Oleg Novitskiy won't be alone for long: NASA's Jack Fischer and Russia's Fyodor Yurchikhin are set to launch April 20 from the Baikonur Cosmodrome in Kazakhstan. The two were monitoring this landing from the Cosmodrome, Navias said during the broadcast. A Soyuz space capsule hangs beneath its parachute while returning Expedition 50 crewmembers Shane Kimbrough of NASA and Russian cosmonauts Sergey Ryzhikov and Andrey Borisenko to Earth in Kazakhstan on April 10, 2017. The landing ended a 173-day mission for the crew. Kimbrough recently performed two spacewalks — one with Pesquet and one with Whitson — to prepare the space station to install a second International Docking Adaptor, which will one day let commercial vehicles dock with the space station. Right now, only the Soyuz can bring humans to the station and dock. NASA astronaut Shane Kimbrough (left) and Russian cosmonauts Sergey Ryzhikov (center) and Andrey Borisenko (right) are seen seated shortly after landing their Soyuz spacecraft on the steppes of Kazakhstan on April 10, 2017. The trio spent 173 days in space during their Expedition 50 mission.